Cucumbers are a very cooling food, in season from May through July. I like to think of cucumbers as nature’s air conditioner. Its green exterior contains vitamin C which helps to sooth skin irritation. The silica in cucumber juice is extremely beneficial for connective muscle tissue, which aids bones, tendons, ligaments and cartilage. Additionally, cucumbers help reduce water retention, heal sunburns and de-puff puffy eyes. These nutritional properties make it an ideal choice for healthy glowing skin. 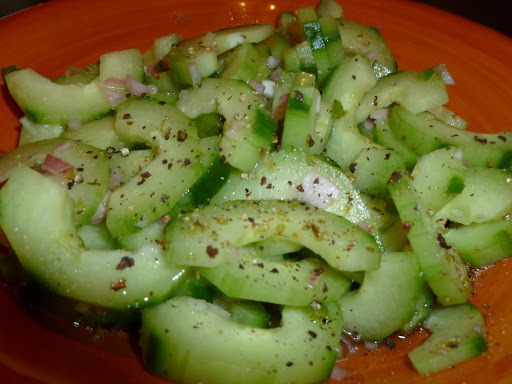 Just writing about this, I want to make some cucumber water… but I think I used it all for this salad. Well, looks like I’m making another trip to the store. When doing anything with cucumbers, I give the dark green skin a good scrub to get any bitter waxy texture off. With a vegetable peeper, skim stripes into the flesh, taking off about half of the skin; personally, I think the skin is a bit tough, plus the stripes create a prettier presentation. The seeds are optional as well. They can make a salad watery, so do what you love and make this your own. Mince shallot, in a small dish submerge in vinaigrette. The shallots will become slightly pickled and begin to soften from the acid in the vinegar; soak about 10-15 minutes. While this process takes place, peel the cucumber, slicing it length wise, remove the seeds with a spoon to trace/indent around the seeded canal; slice cucumber thinly and set into a larger bowl. Add pickled shallots and vinaigrette. Let sit another 60 minutes to marinate, then season with salt to taste and serve. Love this! Thanks for the tip today about making enough for leftovers the next day. Going to make your marinated mushrooms this weekend! They are so good! Again, make double, roughly chop in a food processor to use as a topping for crostini. Add a little parmesan to serve.